What is an overnight white water rafting trip? When planning a Colorado vacation two things come to mind: fun and relaxation. The perfect combination of these can be found on one of our Arkansas River overnight rafting trips. 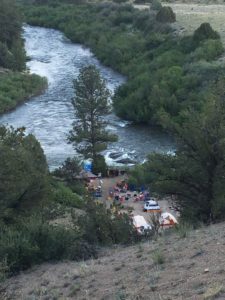 Whether you prefer calm floats or raging white water, there is something special about spending a whole day on the river followed by sharing the days’ experiences under the stars and warmed by the camp fire. Our Arkansas River whitewater rafting trips are exciting in and of themselves, but if you haven’t gone on a Colorado overnight white water rafting trip we HIGHLY recommend it. They are our favorite trips! At Browns Canyon Rafting, you can choose from a variety of stretches on the Arkansas River to accommodate your whitewater needs. If you prefer a relaxing day on the river, you can run class two rapids. If you are looking for more adrenaline we have class three, four and even class five multi-day rafting trips for you to explore (Classification is on a I-V scale, you can learn more here). Our Colorado, Arkansas River, overnight trips are multiple days of white water and amazing, secluded, river side campsites in Browns Canyon National Monument. All Meals starting with lunch on day one and ending with lunch on day two are provided and believe me you will eat well! You will have multiple guides on this adventure who are not only your river guides but your personal chefs and entertainers as well. Our guides have a passion for the outdoors and are great people, by the end of your trip you are sure to be great friends! 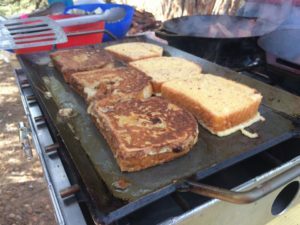 On the first day of your Colorado overnight rafting trip your guides will prepare you an epic riverside dinner complete with appetizers and desert, leaving you time to relax by the fire and enjoy the sounds of the bubbling river and the beauty of the great outdoors. Spending time away from technology and in nature is the best way to bond and fully experience each other’s company. After sleeping under the stars, you will wake up to fresh brewed coffee or tea prepared by your guides, and more time to explore the area while your guides prepare you a hearty breakfast. Soon after you will get river ready, and head out on the river for more fun. After a day of rafting and lunch, you will either stay on the river and camp again or head back to our office. We offer both 2 day and 3 day Arkansas River overnight rafting trip options. Feel free to browse all of our multi-day whitewater rafting options by clicking here. If you want a full outdoor adventure, this is the best way to experience rafting and camping all at once! We hope we can show you a great time on the River! Happy paddling!